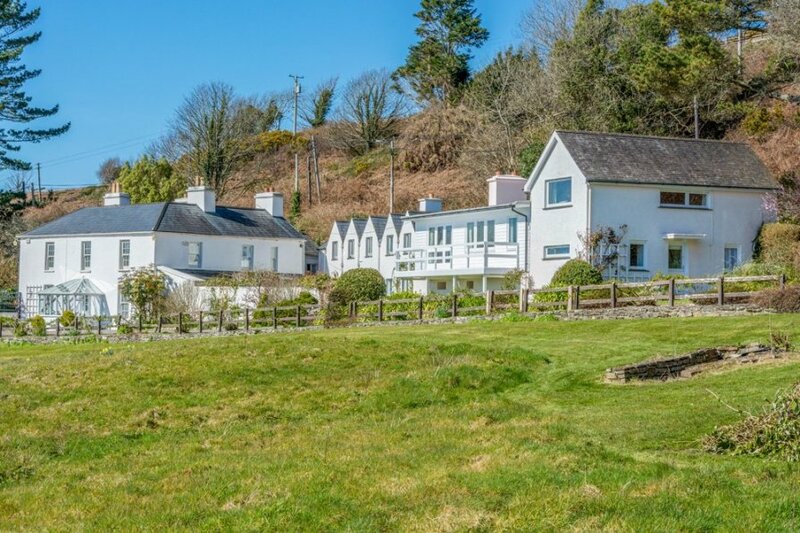 Shorecliffe House is a delightfully charismatic house tucked away along a private lane in the stunningly attractive seaside village of Glandore in County Cork. Shorecliffe House is a delightfully charismatic house tucked away along a private lane in the stunningly attractive seaside village of Glandore in County Cork. The location of Shorecliffe House could not be better, as not only do you have your own private swimming pool, tennis court, direct access to the sea and extensive gardens affording fabulous panoramic views of the rugged coastline below, but you are also a mere stone throw away from Glandore's captivating little harbour where you will find a plethora of pretty little sailing dinghies and the delightful village street where you will find 4 lovely restaurants and a village pub. The main house is imaginative and traditional in design, the interior displays an exquisite combination of contemporary architecture and original features, with quality furnishings and stylish decor throughout, creating a warm homely feel. The exteriors are every bit as tasteful, with a fabulous private swimming pool hidden away in the colourful front garden creating an idyllic secluded oasis, you're really spoilt for choice for places to relax in here at Shorecliffe House. With so much to do and see in and around this idyllic coastline, you may not wish to leave this welcoming haven but if you are able to tear yourself away, why not visit nearby Union Hall, Rosscarbery, Skibbereen or Clonakilty. There is also an additional apartment which accommodates 5 people, and can be rented at an additional cost, taking the total number up to 20. Located in one of South West Ireland's most picturesque harbour villages, Shorecliffe House benefits from a particularly stunning locale. You can see the Glandore harbour from the house and watch the pretty sailing and fishing boats dropping their anchors throughout the day. As it's in the path of the Gulf Stream, there's a mild climate all year round, a factor which is reflected in the array of flora and fauna you'll see as you explore the area. Why not start your trip with a visit to a quintessential Irish pub? Casey's is just 70m from the front gates of the house. Run by three siblings, it's a wonderfully authentic and friendly experience. There's heaps more fabulous pubs and restaurants worth visiting in the area – note that it's worth booking in the summer months as West Cork is a hive of activity at this time. Don't miss the farmers market in Skibereen on Saturday mornings to get the best of the local produce. The house is also within reaching distance of some well renowned music venues; Connolly's bar in Leap, De Barra in Clonakilty and Levis's Corner house in Ballydeho. Levi's has even been voted Best Pub in Ireland! If history's your thing, you can head 2km from the house to visit the Drombeg Stone Circle which is the oldest megalithic stone circle in Europe. If you want activities for you and the kids, you won't be disappointed. There's whale watching, a sailing school and a riding school nearby, and canoeing, windsurfing, paddle boarding and surf lessons can be arranged in a lovely local lagoon. You'll be spoilt for choice with the array of stunning walks along the coast of the Atlantic too, not to mention the stunning beaches in the surrounding area. - Sailing School 5 minute walk away with sailing courses all summer long for 7 year olds up to pensioners! - Canoeing, windsurfing, paddle boarding and surfing lessons all in very safe lagoon nearby.